Digital solutions. Audiophile retail store. Personalized service. German-based Avantgarde Acoustics has been engineering and manufacturing spherical horn speaker systems since 1991. 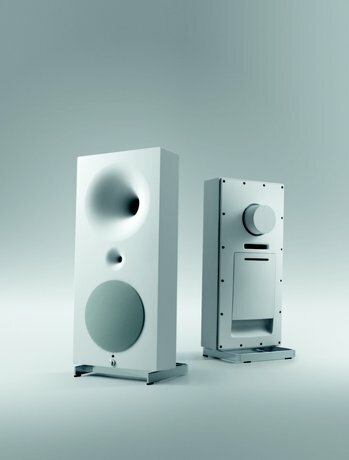 The Avantgarde mission, "Purity meets Performance", accurately reflects their achievement: speakers that provide a listening experience that remains true to the original music through engineering developments that push new limits of technology. Avantgarde boasts its honor of contradicitons: their history is a story of both the" experiment for the scientist" and the "intentional restraint of the minimalist." Nowhere is this mission more achieved than in their Zero 1 Pro loudspeaker system. At Blue Smoke, we are proud to display this unique and ground breaking speaker. Each driver is powered by its own built-in amplifier. Both the tweeter and the midrange use 50W, zero-negative-feedback, Class A solid-state amps, the power supplies of which are identical to the power supply in Avantgarde’s flagship XA amplifier. A 400W Class D amplifier is used to power the woofer. A digital crossover network using 66-bit FPGAs (Field-Programmable Gate Arrays—essentially computer chips that are designed and programmed to order)— and FIR (Finite Impulse Response) algorithms to optimize the entire speaker’s amplitude, impulse, and phase response. Built in DAC and amplification so that all you have to add is a source and a USB or AES/EBU or SPDIF or TosLink cable. The ZERO 1 is a 3-way active amplified loudspeaker system that provides a "plug and play" solution for your digital input. It boasts spherical-horn-loaded tweeter, spherical-horn-loaded midrange and a direct-radiating cone tweeter. Schedule an appointment to hear this revolutionary system sourced by the Blue Smoke Entertainment System Black Box II™ and 384/32 Digital Output™ combination over AES/EBU. Visit the Avantgarde Acoustics website. We are Blue Smoke Entertainment Systems. We design ultra high end digital servers (audiophile and videophile) and we represent some of the finest audiophile manufacturers in the world.